The Aroma Swirl ultrasonic diffuser is a beautiful glass covered diffuser that is beautiful enough to be left on display all the time. It comes with a colour changing light that can be controlled manually to change colours, be set on one colour or run without light. The water tank on the Aroma Swirl has a 130ml capacity and runs up to 6 hours with continuous mist. 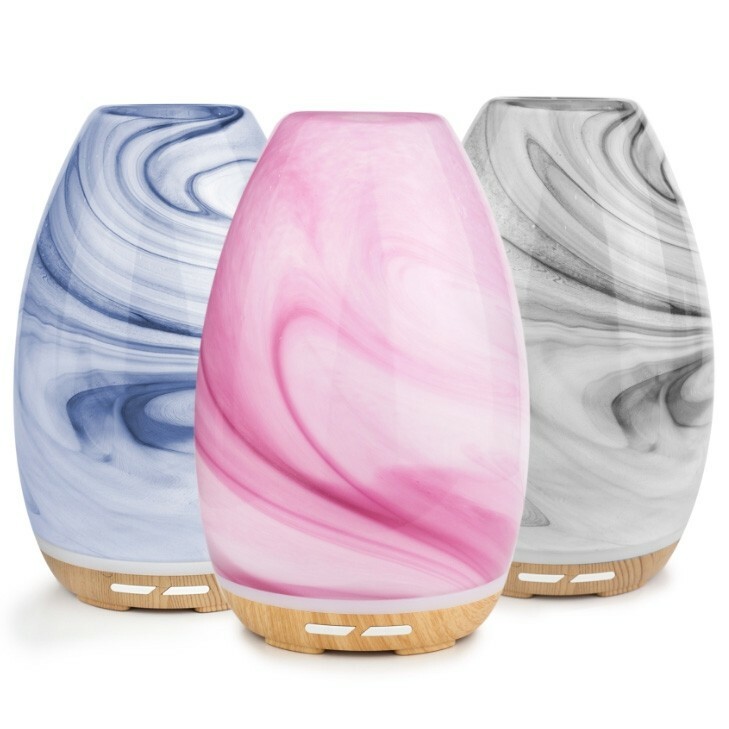 The Aroma Swirl uses ultrasonic technology and cold diffuses your essential oils so they don't lose any of their therapeutic properties, which is especially important when you're buying quality essential oils. COLOUR - Available in Black, Denim (blue) and Pale Pink. Only the Black is kept in our own warehouse. The other two colours are a special order item. Allow up to 10 extra days delivery. This Australian company produce a range of aroma diffusers and essential oil blends for the home. Their versatile range of diffusers come in a variety of shapes and sizes and have different run times depending on the size of the room that you're diffusing your essential oils in. They use cold diffusing and vibration so there's no need to heat the oils.